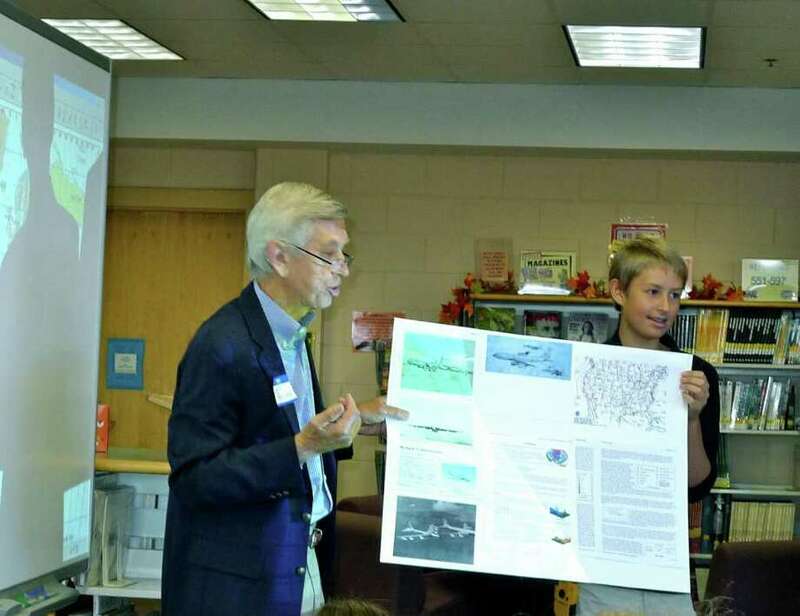 John Peeling, a captain in the U.S. Air Force from 1961 to 1964, gives a presentation with seventh-grader David Wilson. Saxe Middle School held its fourth annual Veteran's Appreciation Day on Friday, Nov. 11. Students had an opportunity to interact with veterans who served our country in World War II, the Korean War, Vietnam and the Gulf War. Veterans, who were presented with certificates of appreciation, spoke to students about their varied experiences in these wars. A "thank-a-vet" tent was set up in the cafeteria where students were able to personally thank the veterans, as well as write thank-you cards for distribution to the West Haven Veteran's Hospital. "Veterans Day is an important day for our Saxe learning community to develop an appreciation for the service and sacrifice our men and women have taken in the U.S. Armed Forces," said Ramona Biondi, who is the library media specialist and co-event coordinator along with media specialist Monica Sheehan. "It links the past with the present and allows our students to develop empathy by hearing history firsthand."